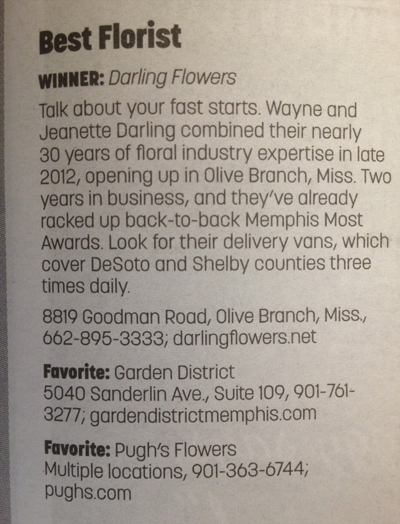 We, Jeanette and Wayne Darling, were so very proud to win Memphis Most Best Florist again for 2014 by readers of the Commercial Appeal! We attended the dinner banquet for the winners and made lots of new friends!! We have been fortunate enough to not have a single complaint or refund in the 16 months we have been open but the following comment from a customer was due to Mother's Day, one of my part time drivers could not get one of the deliveries done so he left at the front door hoping she might see soon......When we found out we sent another, "Hi, I wanted to thank you both so very much for making and hand delivering my mom another arrangement. Her flowers had not been left with a neighbor and sat in the heat. 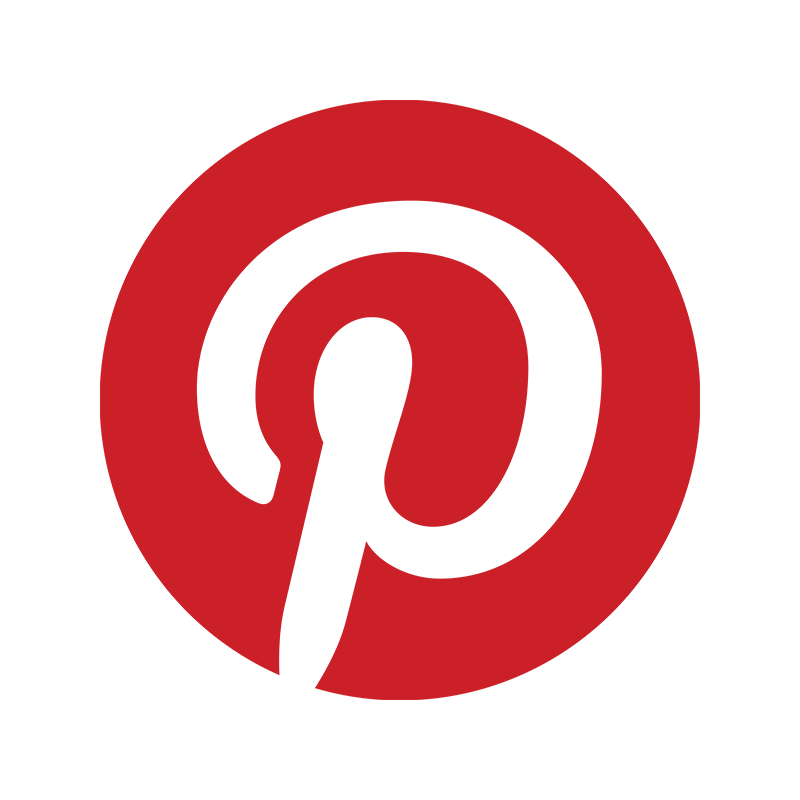 They were delivered and left at her front door that she doesn�t use. She loved the flowers.  That meant so much to her because the ones delivered first didn�t last at all in the heat on sat. She enjoyed meeting you. Said you were so very nice. I think we will both be using your florist in the near future. Thank you more than you know for your gesture. I visited yesterday and saw my mom and her flowers. They were so pretty. My mom can make her flowers last.  Just wanted you to know how much it meant to both of us. Thank you again and God Bless. " We have the pleasure of making people happy everyday and we wanted to share this with you so we have pulled just some of the comments we have received in the last week for you to hear starting with the one we got from this arrangement,"The Darlings are two of the most wonderful people! So easy to work with and transformed my event space to a gorgeous stage! Highly recommended", Also, "What a beautiful arrangement! I so appreciate being able to see it via text! Thank You! ", and "My husband surprised me with a lovely bouquet of fresh blossoms from Darling Flowers one week ago, and I am still enjoying them! The bundle consists of liatris, pink snapdragons, fragrant stock, bright sunflowers, cheerful gerbera daisies, and seeded eucalyptus! As someone that once worked in the wholesale flower industry, I give Darling Flowers two thumbs up for freshness, variety, value, and customer service! ", we could go on but why don't you just call us and see why these folks feel this way? Valentine's Day 2014 was an enormous success and the number of compliments are still pouring in over phone, email and text. We sent many photos to clients of their arrangements as they were being delivered even though Vday is the one day of the year that we warn customers it may not happen. The following is a restaurant owner in the area that we provide flowers for, "You should have seen the smile on my wife's face when she saw her flowers !! 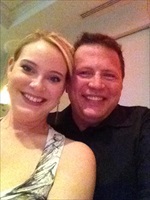 Thank you both..........And the Restaurant looked awesome,many many compliments !!!" Wayne and Jeanette Darling want to wish everyone a happy holiday season on behalf of Darling Flowers. We had some healthy criticism from the recipient of a floral arrangement this week that reminds us that we are in the business of creating what the customer wants and deems beautiful and our job is to create that for them. Regretfully, in this business of artistic design and freedom, sometimes those two things miss the mark entirely and in this case miscommunication was the culprit. The order originated out of town at a different florist and their instruction to us late afternoon for same day delivery was simply "mixed flowers" and of course this leaves a truckload of room to design anything really. 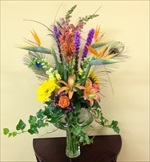 The recipient did not like our creation and pointed out a popular Memphis florist and their design approach as an acceptable arrangement.....Jeanette and I gave this a lot of careful thought and given the circumstances there was no way we could have done anything different. While we also LOVE this florists design approach, it ties us to one particular style of design while we prefer to make anything that any client wants. Some like carnations, some like lilies, some are allergic to lilies and hate carnations. Our job as florists is to create what the customer wants and as with anything in the public, tastes vary, so we will continue to make our "best guess" in these situations but want to assure everyone that we started this business as a way to bring joy and happiness into peoples' lives and it is not our intent to bring misery to anyone. We love our customers and florists that entrust us with their orders and we will create anything you want with any flowers and/or colors or design styles that are given. Darling Flowers wants to be the People's Florist so please help us to be that for you. Please vote us as a write in for Best Florist. You have to vote for half of the categories at least, 62 is half, to be counted. If you do not have the time to fill all those out, the Darlings will place your ballot for you if you email them your name, telephone, email and zip. Your information will only be used for the Memphis Flyer ballot and they are not sharing with anyone. The website is http://bom.memphisflyer.com and thanks for voting! Voting ends July 28,2013. 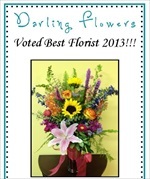 Darling Flowers learns that it has been voted "Best Florist" in the mid-south. This award is all the more exceptional considering this is Darling Flowers' first year in business. Mr and Mrs Darling credit this achievement to their 34 years in the floral industry. Be sure to keep coming back for more news on this award and upcoming specials. Congratulations Preston Chandler Darling on graduating Bartlett High School and for attaining the President's Merit Scholarship to the University of Memphis!!! If this picture was at all visible you would see Mr. Preston on the stage getting his diploma. We will be open Mother's Day Sunday May 12!!! For morning only but will deliver until we are done!!! Please deliver Saturday if you can but if you have no other option know that Darling Flowers will do it on Sunday. Darling Flowers had the honor to supply a gift for the silent auction at Germantown Performing Arts Center's annual Gala this year! We have supported GPAC both in business and in spirit for many years now so it was with great pride we made this arrangement for their auction fund raising efforts. Please support GPAC or the arts in your community however possible. The ribbon cutting was fantastic and we really enjoyed having everyone here. We look forward to the next gathering and will announce it soon. Garrett Cannon, Millington, TN won the Like contest on facebook! We congratulate him and look forward to our next facebook contest that we will announce soon!! It will be great, maybe a year of flowers???? Today we had the pleasure of making another bride happy. She is now off to start her life with the man of her dreams! This was her bouquet and her favorite flower. We are so glad she allowed us to be a part of her special day! We announced on Facebook this morning that a contest is being held for the number of Likes we receive on our facebook page,"facebook.com/darlingflowersinc", between now and March 6th we will award one person a vase of 18 roses their choice of color delivered anywhere anytime in 2013! Be sure to share with as many friends and colleagues as possible. Winner will be announced at the Ribbon Cutting right after March 6 deadline. Valentine's Day was a huge success! We thank all those customers who allowed us to be a part of their Valentine's Day! 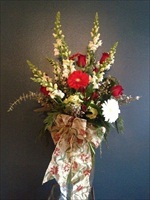 Thanks to all who have visited our website and don't forget about facebook at www.facebook.com/darlingflowersinc. We are open! Valentine's is going great so far and we love our specials!!! Like us on Facebook, www.facebook.com/darlingflowersinc and visit our webpage often as it changes almost daily!! Call 662-895-3333 to place your order. Darling Flowers welcomes the new year in style!! In our efforts to expand our website in 2013 for the month of January, any order that you allow our design team to create something new, we will offer a 10% discount in order to add that item to our website! 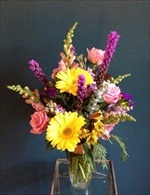 Simply say you want to place a designer choice fresh flower order! Darling Flowers physical location at 8819 Goodman rd, Olive Branch, MS is now scheduled for opening Jan 27!! Telephone is 662-895-3333. 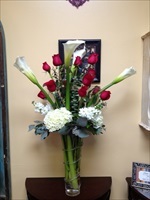 The following came from the customer who received a Linda's Choice arrangement, "The flowers arrived yesterday and they are beautiful - and huge! The arrangement is absolutely stunning and huge! The flowers, particularly the roses, are vibrant Christmas colors lots of reds and whites - and huge!,Did I mention how huge the arrangement is!!?? Your friends should be wildly successful if the flowers you sent are an example of their work." Jeanette and Wayne Darling(and Willie! )are proud to have signed a lease for our new shop, Darling Flowers! We look forward to servicing Desoto and Shelby county at least twice daily and make sure your Darling has fresh flowers from us today! Site Hosted and Design byDesoto Systems, Inc.